The word krausen describes the foamy head that develops on top of fermenting beer. It is used by brewers to gauge when the fermentation process is going strong and when it is complete. If you're new to homebrewing, it's important to understand what krausen is and some of the issues that can come up. Fermentation is the most critical stage in brewing, and the health of your krausen is key. Pronounced kroy-ZEN, krausen is both a verb and a noun used during the fermentation stage of brewing beer. As a noun: The foamy, rocky head of yeast that forms at the peak of fermentation. As a verb: To introduce measured amounts of actively fermenting beer that has reached the most active point of fermentation to more thoroughly fermented beer. This is usually done to condition or naturally carbonate the beer. In conversations with other homebrewers, krausen will most often be used as a noun. It is an indicator that your beer is fermenting. When the krausen falls, that fermentation is complete, and you're ready to keg the beer. This means that krausen is very important during the fermentation stage and homebrewers have quite a few questions regarding it. First of all, it is important to be patient during fermentation. This is when the yeast is most active, and each strain of yeast and beer recipe will have different fermentation times. It can take anywhere from 1-2 weeks before fermentation is complete and if you have done everything right in the process, it should only be a matter of time. The development of krausen is a sign that you have happy yeast. Remember that it is a living organism and it requires certain conditions to grow and convert sugars to alcohol during the fermentation process. It's just one more indicator that brewing is a science more than anything else. Fermentation is the fascinating part of brewing beer, and it comes with a few different stages. 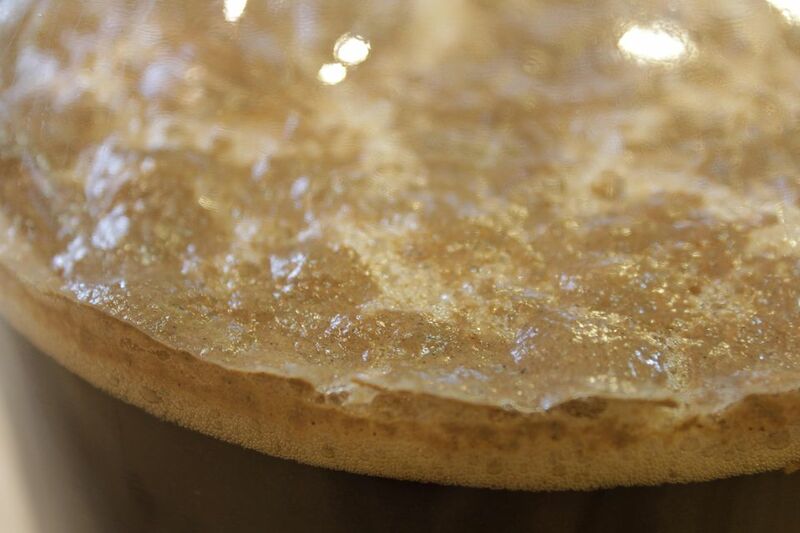 Before a krausen develops, the brew will bubble and burp. Just like your body, this means that gasses are being released. Again, the time it takes for this to happen depends on your yeast and beer recipe. The burping can begin within the 12 hours after the yeast is introduced and the krausen can begin to develop 6-24 hours later. Or, the process can take much longer. Patience is key. Homebrewers often use the words 'crash' or 'fall' when talking about krausen. This means that the foam head has formed and then it has gone away. When krausen crashes, it is the signal that fermentation should be complete. However, the only true way to know for sure is to take a gravity reading. Hopefully, you're brewing in a location that is easy to clean up should you have what brewers call a 'blow out.' This happens in the fermentation tank and means that your beer is a little too active for your equipment. A blow out occurs when the krausen has created too much foam. It may block your airlock and cause pressure to build up inside the tank. This will either cause a leak in the airlock or blow the device out completely. In the worst case scenario, your entire fermentation tank will give way to the pressure and break open. This leaves you with a mess to clean up and requires that you start the brewing process all over.